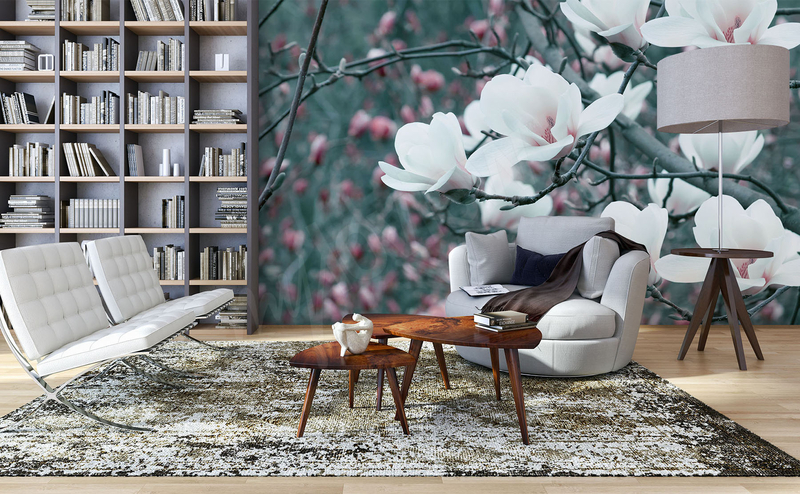 If you are looking for an elegant, stylish and original floral decoration for your interior, a magnolia mural is the best solution. As one of the first heralds of spring, this distinctive plant with its delicate petals will add a pleasant, optimistic character to the arrangement. You can opt for a design featuring lush buds on the background of blue sky, graphics depicting a single branch on a neutral background or a drawing reminiscent of a card from an old herbarium book. The advantage of this floral motive is that it suits any interior. A magnolia wall mural will liven up a muted kitchen arrangement, introduce a romantic atmosphere into the bedroom, freshen up the appearance of the living room and will be a beautiful decoration for a beauty salon. Modern, minimalist or traditional? The living room – a space where you spend most of your time – should reflect your personality and preferences. Whether you love industrial accessories, antique furniture or quirky accessories, a magnolia mural will look great in any arrangement – simply choose the right design. Black-and-white, artistic photograph will work great in a modern interior, a single branch full of pink buds will liven up a minimalist interior, while a mural reminiscent of a work of contemporary art will be ‘the icing on the cake’ for an industrial living room. Floral motifs are always up to date, so when you decide to decorate your room with magnolias, you can be sure that you choose a beautiful and timeless design. When designing your bedroom, it is worth taking into account the right choice of colors. Some people need muted, soft shades to wind down after a hard day's work, while others need bold, energetic color combinations more than a cup of espresso for a boost of energy in the morning. If you belong to the first group, a magnolia mural in pale pink will be an excellent choice. Look for a design that features flowers on a light-colored background or opt for an old-fashioned mural in a slightly yellowish tone. This decoration is perfect for a romantic bedroom in a shabby chic style. However, if you feel better surrounded by vivid colors, a magnolia wall mural on the background of a cloudless sky or lush grass will certainly appeal to you. The characteristic combination of colors: pink with green or violet with blue will make the arrangement more dynamic and introduce a dose of positive energy into the interior. Magnolia is not only a beautiful ornamental plant. It is also a delicious snack that will appeal to lovers of sophisticated flavors. Pale pink petals can be marinated in vinegar, salt and sugar, and after a few days you can enjoy their distinctive taste or use them to decorate elegant dishes. While waiting for the petals to be ready to eat, you can look for the right magnolia murals to decorate your kitchen. If you love not only culinary, but also interior arrangement experiments, opt for a bold design in the form of a drawing. The combination of vivid colors such as green leaves, pink magnolia flowers and yellow daffodils creates a unique decoration that will delight you every day. A wall mural for the kitchen can also feature an important quote or motto. Choose a design that apart from a stunning branch full of magnolia flowers has a space for your own text. Magnolias are truly plants for special purposes. They work well not only as a decorative element or a quirky delicacy. They can also be used to prepare fragrant oil used in aromatherapy or a face wash infusion to brighten your skin. 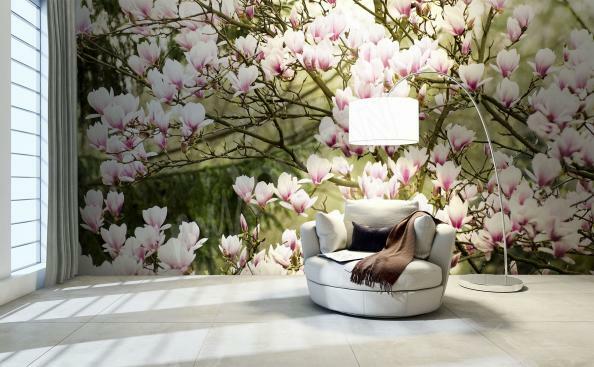 That is why a magnolia mural is perfect as a decoration for a beauty salon or SPA. A delicate branch on a white or pink background introduces a gentle atmosphere into an interior, conducive to relaxation and rest. Depending on the décor of the salon, the mural can have a form of a realistic photograph of the plant against a sky or meadow backdrop or a minimalist drawing in black-and-white tones that will blend into the décor constituting an extremely subtle decoration.